Spawn 98,101,102,120......164. 30 comics, not a complete run, but awesome. SPAWN #96 NM, 1st Appearance of Domina (2000), Movie, HOT! 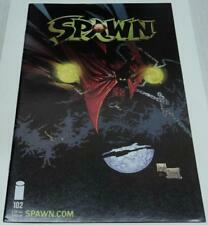 (2000) Todd McFarlane Spawn #100 Alex Ross Variant Cover! This page was last updated: 21-Apr 09:42. Number of bids and bid amounts may be slightly out of date. See each listing for international shipping options and costs.